Transportation certainly makes for the blood vessels of any economy irrespective of its size. With new developments taking place in the transportation sector and a constant development in the supporting infrastructure, there is a lot to do for those who provide products, materials, tangible and intangible services that serve this industry. If you too are one of those looking to unlock new opportunities in the transportation sector, Blue Mail Media’s Transportation Industry Email List can be a highly rewarding strategic resource. 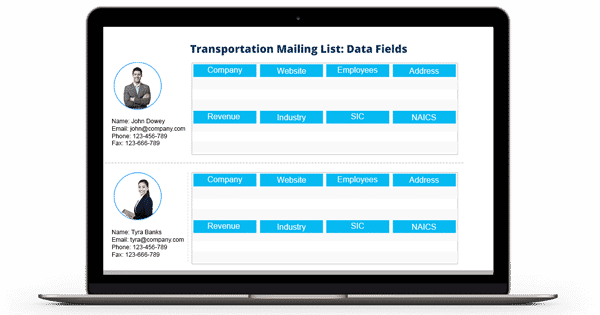 Blue Mail Media’s Transportation Industry Executives Email Database connects marketers with decision makers in the transportation industry with ease. Our database gives you complete access to marketing information to connect with your target audience via telephone, email or mail. Our team of data specialists put immense hardships in making sure our data remains updated and reliable at all times. Reasoned to our strong data partners’ network across regions such as the US, UK, Canada, North America, Europe, Russia, China, Australia, New Zealand, India and others, Blue Mail Media can help clients without any geographical constraints. Blue Mail Media gives you enough flexibility to either choose from our pre-packaged Transportation Business Email List or get a customized list created as per your campaign specific requirements. With our data, you are sure to realize greater response rate, conversions and a healthy ROI.